Golden State Warriors fans at Oracle Arena have been chanting "MVP" for months, but on Monday it finally became official — Stephen Curry is the Most Valuable Player of the 2014-2015 NBA season. Curry finished with 100 of 130 first-place votes, beating out James Harden (25 first-place votes) and LeBron James (5), capping an epic season that vaulted the point guard into the record books and solidified his status as a superstar. The hardware, the Maurice Podoloff Trophy, will be presented Tuesday night in Oakland when the Warriors host Game 2 of the Western Conference semifinals against the Memphis Grizzlies. 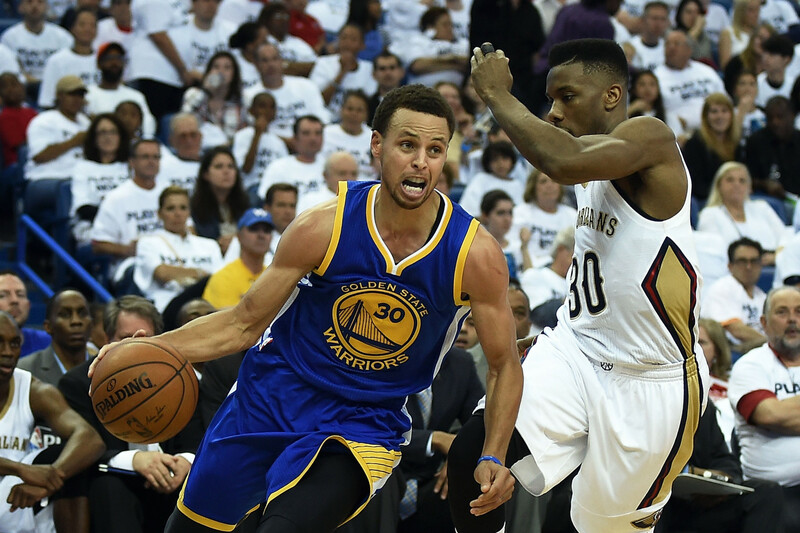 The Warriors won Game 1 on Sunday, 101-86. The 27-year-old becomes only the second player in Warriors history to win the award, joining Hall of Famer Wilt Chamberlain, who won the award for the 1959-1960 season with the Philadelphia Warriors, as a 23-year-old rookie. Curry is now, unquestionably, one of the game’s best players — a status that many thought impossible. The slender, baby-faced, 6-foot-3 point guard out of Davidson College in North Carolina, was picked seventh overall in the 2009 draft. Many doubted that Curry’s game would translate to a more physical pro game that was trending toward bigger guards. After some early career struggles and two ankle surgeries, Curry has finally put it all together to become the "Baby-Faced Assassin." His season numbers this year — 23.7 points/game, 7.7 assists/game, 2.0 steals/game — belie his dominance. Those totals rank sixth, sixth and fourth in the league, respectively. While those rankings aren't anything to sneeze at, this is not typical MVP statistical dominance. Nevertheless, anyone who has watched Curry lead his Warriors to an NBA-best 67-win season knows how valuable he is to his team’s success. According to ESPN, the Warriors outscored opponents by a staggering 920 points when Curry was on the floor, by far the highest point differential in the league. While that number is certainly aided by a terrific supporting cast around him -- teammates Draymond Green (+837) and Klay Thompson (+776) had the second- and third-best plus-minus numbers, respectively -- Curry, as the best player on the league’s best team, makes everyone around him exponentially better. 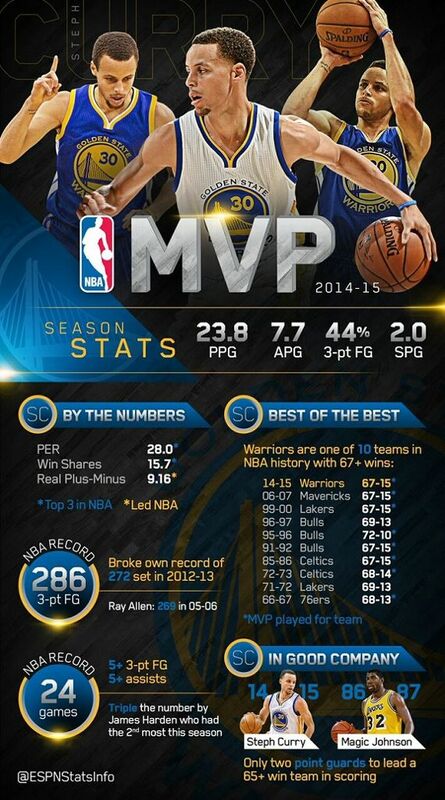 A breakdown of Curry's 2014-15 MVP Season, courtesy of ESPN Stats & Information. Another tidbit courtesy of ESPN Stats & Information: This year, Curry joined Magic Johnson as the only point guards to ever lead a 65-win team in scoring. This year, Curry and the Warriors were so good, and their leads so big, that he didn’t have to play a whole lot in the fourth quarter. He averaged only 33 minutes per game, a number topped by 40 players in the league. That is the fewest minutes played by an MVP in league history, according to the Warriors' official release. Stephen Curry has won MVP because he unleashed a season that was dominant and, well, fun. The latter part is generally accepted — Curry's style of play is as close as we can get to 'objectively fun.' The first part — that dominance — is still seeping into the public consciousness. It just doesn't make intuitive sense that someone that height (6-foot-3) and that slight build (190 pounds) can impose his will on the NBA. It’s not unheard of for a smallish guard to win the award. Derrick Rose (6’3”) won in 2010-11, Steve Nash (6’3”) won the award in back-to-back seasons in 2004-05 and 2005-06, and Allen Iverson (6’0”) won in 2000-01. But, Curry’s game, and brand of dominance, is different from any of those guards. The league shoots more 3s every season — this season, again, saw more 3s than ever before. It only makes sense that its MVP just broke a made 3-pointer record that he had previously set. Curry as most valuable player conveys how 2014-2015 is the season when 3-pointers took center stage. And this evolution means guards now boast the dominant impact centers once claimed. Curry doesn't boast the ultra physical version of dominance we associated with Shaquille O'Neal's tendency to cave in defenses, but his is dominance nonetheless. Shaq bashed defenses till they broke. Steph stretches defenses till they snap. With award season upon us, the Warriors are being recognized for their dominant year beyond Curry's MVP. Last week, team general manager Bob Myers won NBA Executive of the Year, rookie head coach Steve Kerr finished second for Coach of the Year, and Draymond Green finished second for Defensive Player of the Year. At a press conference Monday afternoon, Curry thanked each of his teammates and coaches one by one and said he is "truly honored to be your MVP this year," but that there is still more work to be done this season. "Bringing home a championship is the ultimate goal. This is a minor checkpoint on that mission. We're gonna make a strong push at this thing." As of this weekend, according to FiveThirtyEight, the Warriors had a 67 percent chance of accomplishing that goal.